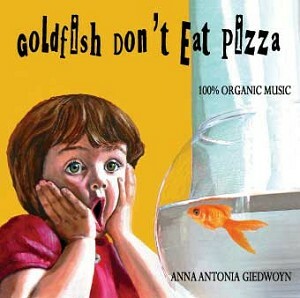 The music is secular, but many of the lyrics and stories contained in this debut kids’/family album, “Goldfish Don’t Eat Pizza,” reflect Gospel values such as unconditional love and tolerance. “The songs reflect my values as a Catholic, an animal and nature-lover, and a Portland devotee,” said singer Anna Giedwoyn. For instance, she said, the song “You Can Be Anything” assures young listeners that a loving presence will accept them for whoever they are despite any perceived shortcomings; that presence may be interpreted as a traditional parent or a divine parent: God. “My Old Dog” also tells the story of unconditional love, this time generously given by a beloved pet. The songs are inspired in part by Giedwoyn’s nephew, Aleksander Mizgajski, and in part by the singer’s work with children over the years. Giedwoyn grew up attending Mass at St. Stanislaus in North Portland, and still has strong ties to that parish, but is currently a member of Ascension Church in Southeast Portland. “Every Easter we go to the Polish Church to get our food blessed,” she said. The blessing of Easter food is a tradition dear to Polish families. Giedwoyn and her sister are first-generation Polish Americans who were born in Portland and grew up bilingual. They both attended Catholic schools – first All Saints School, then St. Mary’s Academy – before attending college. Giedwoyn’s nephew and inspiration attends St. Mary’s Cathedral School. In December, the singer appeared on KATU’s AM Northwest and performed “The Day You Were Born,” a song about the joy children bring to people’s lives. The debut album contains 22 original children’s songs written and sung by Giedwoyn. The album is available to order through her web site, www.AnnaAntoniaMusic.com, and will be available on CD Baby, iTunes, and Amazon.com in early 2011.